through the coppice of his leaves. leaping moray tail slicing current. to track her mate by the swells of Matelot. in his aspect of bayleaf and tamarind. I have homes for them in me. knotting wedding rings like balata hearts in her palms. I woke with the island making a new animal in me. and cured it over the boatwoman’s cloven hoof. between the tines of her smile, slivering it for profit. I went to the island because the animal asked me. backbone or floorboard. Someone spoke, duenne or baptized. I raised my eyes to the coiled hair of the forest. I read for promises in the inhuman tracks under my feet. When I scaled the dying hospital, the animal followed. cast the roof of its shelter beneath the abbey skylight. Claw and palm, we muscled the darkness with an ancient nativity. my pulse so the animal might make an island of me. watched it spread out in a sharp net, splintering. roved her til you compassed up. flying between your hair, the mountain’s, and theirs. 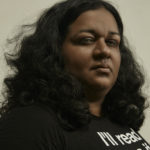 Shivanee Ramlochan is a Trinidadian book blogger, critic and poet. Her debut collection, Everyone Knows I Am a Haunting (Peepal Tree Press, 2017) was a finalist for the 2018 People’s Choice T&T Book of the Year, and was shortlisted for the 2018 Felix Dennis Forward Prize for Best First Collection.